Editors note: A photo is included with this press release on Marketwire's website. Corel today announced Corel® Home Suite, a new collection of applications for running efficient households and sparking creativity in families. An ideal solution for the home PC user, the new suite brings together tools for tackling office tasks and creative photo projects. Affordable and simple to use, Corel Home Suite includes Corel® Write for word processing, Corel® Calculate for spreadsheets, Corel® Show for presentations, Corel® Photo Album™ Deluxe for photo-editing, and Corel® Paint it!™ for turning photos into amazing paintings. For many households, the home PC acts as a hub - a place for completing homework, finishing up work assignments and creating fun family projects. With Corel Home Suite, families will be able to accomplish a wide range of everyday computing tasks with tools to help manage household finances, create newsletters or flyers, touch up photos and create beautiful scrapbooks, calendars and photo albums for showcasing precious memories. "Today's families are busier than ever and they are conscious of managing their budget. That's why it was important to us to create a solution that made a meaningful difference in how they run their households," said Jason Larock, Director, Product Management for Corel. "The beauty of Corel Home Suite is that families buying a new computer will be able to do most of what they want on their home PCs from managing budgets to creating homemade gifts without spending hundreds of dollars buying separate applications." Corel® Photo Album Deluxe™: Quickly edit and share your photos and videos and automatically back up your files online to keep your memories safe. Corel® Paint it!™ : Quickly transform digital photos into unique, hand-painted works of art in three simple steps with Parent Tested Parent Approved photo-painting software. 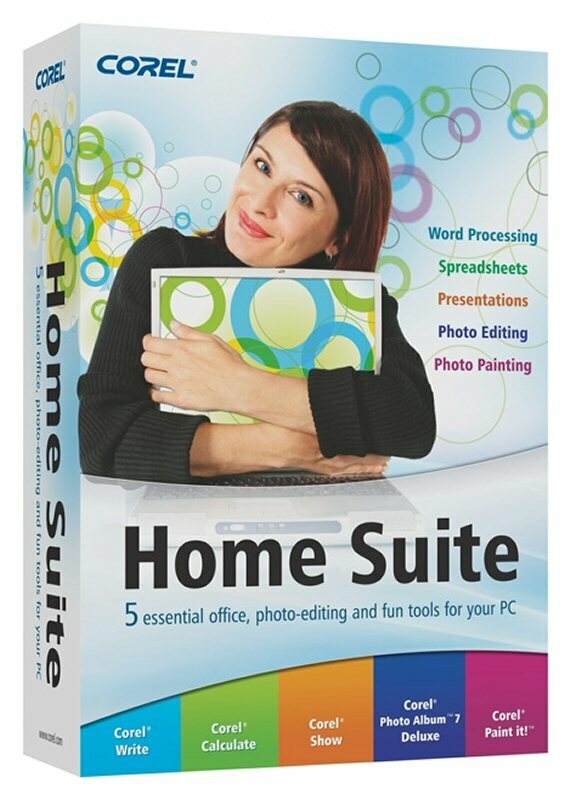 Corel Home Suite is available today from www.corel.com for a suggested retail price of $69.99 and at selected retailers across North America. To learn more about Corel Home Suite, please visit www.corel.com/homesuite. Our award-winning product portfolio includes some of the world's most widely recognized and popular software brands, including CorelDRAW®, Corel® Painter™, Corel DESIGNER®, Corel® PaintShop Photo®, Corel® VideoStudio®, Corel® WinDVD®, Corel® WordPerfect® Office, WinZip® and Corel® Digital Studio™. © 2010 Corel Corporation. All rights reserved. Corel, Corel DESIGNER, CorelDRAW, Corel Paint it!, Digital Studio, PaintShop Photo, Painter, VideoStudio, WordPerfect, WinDVD, WinZip and the Corel logo are trademarks or registered trademarks of Corel Corporation and/or its subsidiaries. All other product names and any registered and unregistered trademarks mentioned are used for identification purposes only and remain the exclusive property of their respective owners. Corel Home Suite includes Corel Write for word processing, Corel Calculate for spreadsheets, Corel Show for presentations, Corel Photo Album Deluxe for photo-editing, and Corel Paint it! for turning photos into amazing paintings.